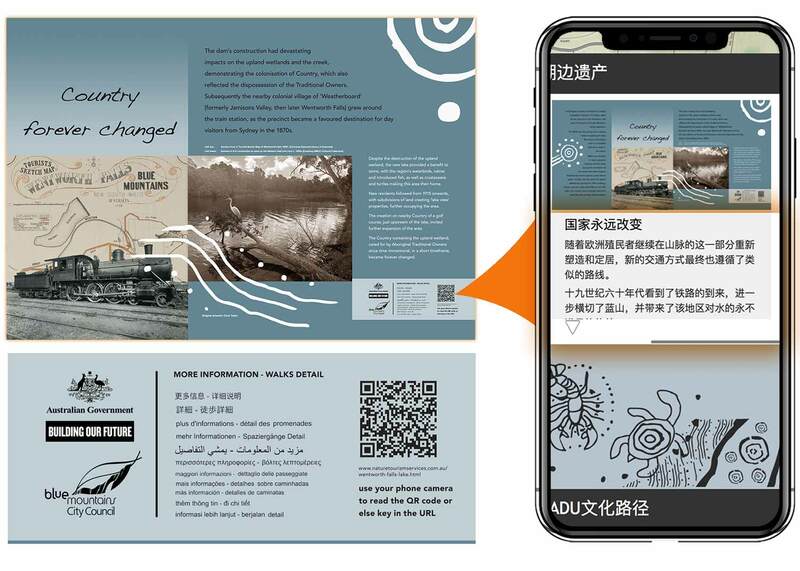 Developing multi-lingual and multi-cultural interpretive and visitor orientation platforms is a priority area for Nature Tourism Services' research and development program. Today traditional models of communicating with visitors to natural areas are being challenged by technological innovation. People now expect to be able to choose content of relevance to them and to read this in a language they can understand. This model of service delivery underpins the user accessibility structures and guidelines public agencies must ensure are built into their communication platforms. This typically sees content published across a range of formats including print/signage, HTML(web) and PDF to ensure that people with special needs (non-English speaking / visually impaired etc) can access this content. Embracing this multi-platform delivery model for visitor orientation and interpretive media is essential in order to bring this field into line with modern user needs and expectations. Above: Example from Wentworth Falls Lake signage in the Upper Blue Mountains showing how content can be easily published on both signage and HTML platforms as part of a single integrated product solution. Alongside issues relating to multi-lingual access, interpretive and visitor orientation content must be grounded on a multi-cultural platform. This recognises all content being presented in Australia stands on the bedrock of Aboriginal connections to Country. Integrating this multi-cultural dimension into interpretive and visitor orientation media across a wide range of subject areas requires close consultation with Traditional Owners coupled with creative design solutions. Above: This sign from the Walls of China Carpark entry precinct in Mungo National Park shows how the the park's emblematic trail of Aboriginal figures moving across the landscape can be used to underpin both modern European cultural messages as well as other content directly related to Aboriginal heritage. 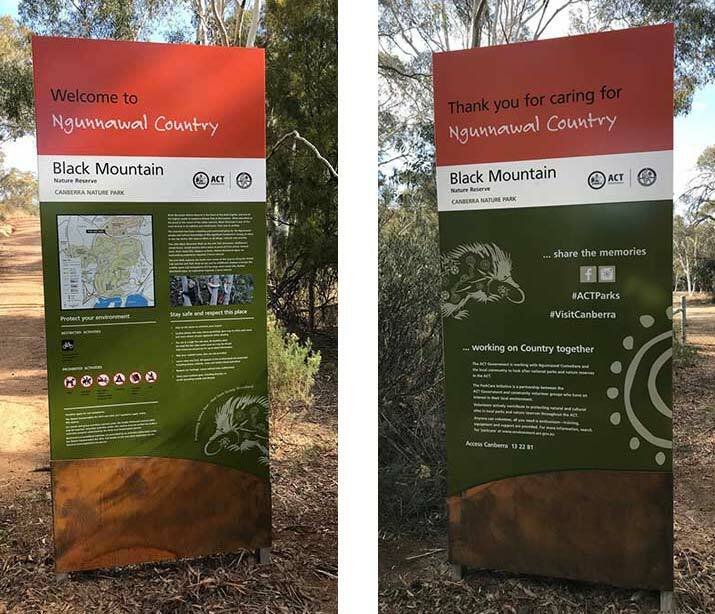 Above: The whole of agency signage palette we designed in concert with the ACT Parks and Conservation Service in 2017/18 features a prominent Welcome to Country top section as an integral part of the signage ensemble. 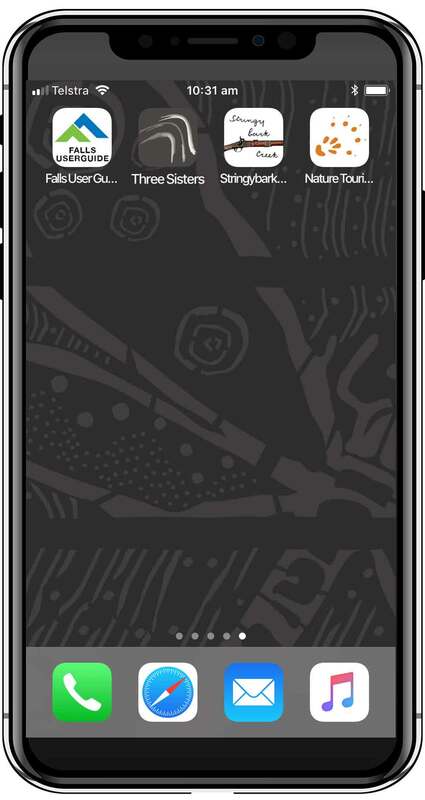 This structural response is supported by design motifs specific to the different reserve groupings across the territory as produced by a Ngunnawal artist. The Australian Government Digital Transformation Agency working in concert with the Government content advisory platform has laid out clear guidelines for the development of new digital content platforms. Central to their mission is the simple credo of "designing content so that everyone can use it". "Make it accessible – ensure the service is accessible to all users regardless of their ability and environment". "You need to make sure everyone who needs your service can use it. This includes people with disabilities and older people, and people who can’t use, or struggle with, digital services." "Your service must be accessible to users regardless of their digital confidence and access to a digital environment. This includes users in remote areas and users’ different devices." Nature Tourism Services' digital product solutions have been designed to meet these criteria whilst also being easy to integrate into land managers existing funding and operational maintenance systems. 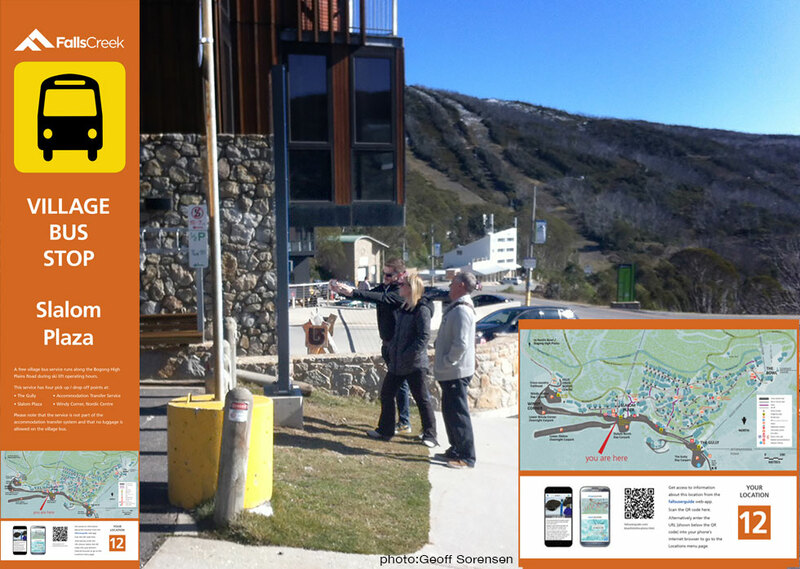 Above: The bus stop sign at Slalom Plaza at Falls Creek Alpine Resort in the Victorian High Country is supported by the Falls User Guide online web app platform. This provides access to over 1 GB of custom content designed to meet the needs of visitors once they are on site in the resort. This content can be provided in the user's language of choice in accordance with how they have configured their internet browser settings. The photo above is an impromptu picture showing a group snapping the QR code on the sign in order to access this online resource. The principles of accessibility and inclusivity underpin the Falls User Guide product platform. People do not need to have undertaken any prior preparation in order to access the content. They do not need to have downloaded an app to access the guide as their phone camera can recognise and interpret QR links of its own accord. 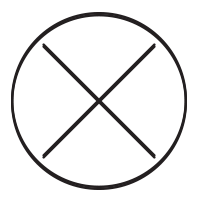 Nor do they need to be able to read English given the universal symbolic recognition QR codes now enjoy. Additionally the web app works on any mobile device irrespective of the operating system or the age of the system software. This is because content is delivered through the mobile device's own internet browser. Unlike an app setting where the content is wrapped in a specific coding package designed to render unnecessary inbuilt system apps like internet browsers, the web app only delivers such data / content as specifically requested by the user. This minimises data transfer and allows for ease of use for international visitors with limited data plans. It also ensures people with no excess storage on their device to devote to an additional app download can still access the product. Were Falls Creek not to have the excellent internet coverage the resort enjoys, the web app could still be delivered on site via tiny solar powered Raspberry Pi servers setting up local area wi fi hubs delivering the static webpage content in the fast and efficient manner these were specifically hand coded to achieve. 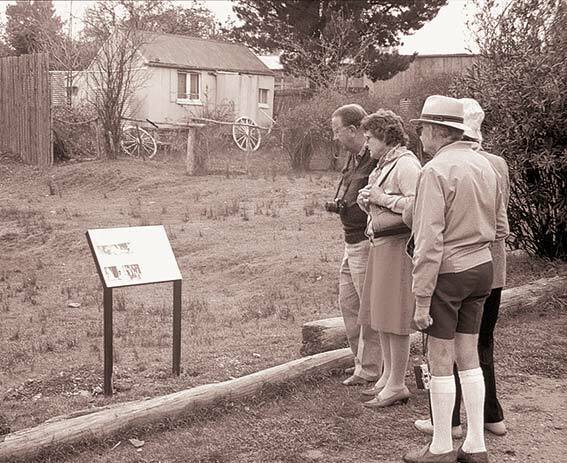 Above: The fundamental transactional model in place at Hill End when this photo was taken in 1988 remains largely unchanged in most outdoor user settings today. Here the visitor is the passive consumer of pre-packaged content prepared on their behalf by the knowledge holder / manager. 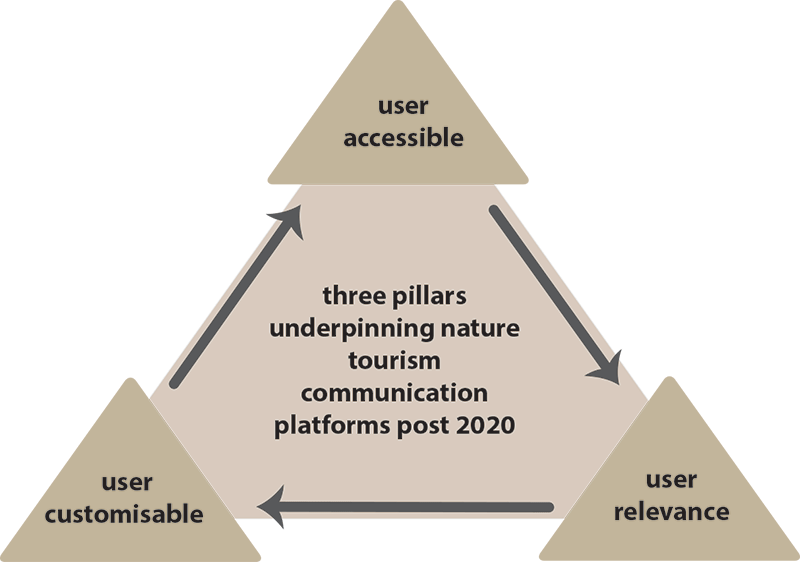 Nature tourism providers must look to establish a new business model for their communication platforms if they hope to remain relevant and comply with best practice delivery systems in a post-2020 operating environment. Above: When taking a photo of the map on orientation signs now the camera can recognise the QR code and offer the user a link to download a PDF smartphone tracknote version of the product. Above: When the user selects the "Save to home screen" option while browsing a web-app a quick link icon is set up on their home screen. This provides easy return access to the content delivered through their mobile device's internet browser. User accessibility is the central point of entry to any information content delivery platform. As the Australian Government best practice guidelines make clear – content must be designed so that everyone can use it. The service must be accessible to all users regardless of their ability and environment. Additionally they should be able to access the information in their native language wherever the technical opportunity exists to do this. This best practice content delivery obligation has underpinned Nature Tourism Services' investment in customising web app product solutions. The web-app product is easily delivered in low cost packages ranging from hundreds of dollars for a single sign through to major content platforms providing resort wide coverage underpinned by 1GB of data in the case of the Falls Creek Alpine Resort model. Using static webpages means the content can easily be hosted within existing agency digital ecosystems as either resource folders or sub-domains without the need to integrate it into the underlying CMS databases. Web-apps that simply deliver content on demand via the mobile device's internet browser avoid the accessibility hurdles faced by providing content packaged in a downloadable app format. Installing an app requires the user to have space on their mobile device to host the content and a willingness and ability to access their app store. Visitors with minimal data plans (typically overseas visitors) may also face up front download costs in order to assess the content unless public wi-fi is available. Choice of language options are also difficult for apps to provide even across two or three language versions. Then there are the additional recurrent expenditure costs involved in keeping the app upgraded in line with new operating system releases. These constraints do not mean that apps have no place in the interpretation digital ecosystem – simply that they are best suited to delivering bespoke visitor experiences for specific audiences. They are not suited to provide core "base-load" equal accessibility information content. User relevance is something we now take for granted when engaging with digital content. Search engines mean we are rarely more than a few clicks away from the answer to a given query. This user expectation is something people increasingly bring with them to an outdoor setting. It is not enough to provide content - it must be customised, relevant content. The limited user acceptance of QR codes to date partly reflects how these links typically direct the user to a generic web platform of no immediate relevance to them. It also relates to the fact that people used to have downloaded a QR code reader app in order to snap them. Now with QR code reading functionality built into the camera on mobile devices, the capacity for these quick links to play a pivotal role in the user delivery platform is much enhanced. We know for example the location where people are when they click a given code. Making sure that we invest in a custom landing page that recognises not only the user's place in the landscape, but also their priority needs in this setting is essential. The web app response outlined above allows us to deliver this within the standard cost envelope of a given interpretive sign project. The final pillar underpinning this communication ecosystem is recognising that the days when people are prepared to be passive consumers of pre-packaged information presented to them by third party knowledge holders is over. Interpretation needs to embrace this new paradigm if it is to remain relevant in a post 2020 operating environment. This does not mean rolling out the digital equivalent of the visitor centre "interactive" flap you had to lift in order to get access to a piece of information or view a display asset. It requires the heavy lifting of generating the content resources that must underpin an information matrix capable of providing a meaningful array of choices for user engagement. This in turn emphasises the need to have a long term program of generating and enhancing content as a resource in its own right. Packaging content together with an app envelope for example means that if the app is taken down the content is typically lost. Assembling content in static html packages however means that it is a stand alone, cumulative resource capable of being deployed across an array of interfaces. The ability of the user to access this information matrix is only enhanced by future technological developments, not threatened by them. Prioritising content rather than coding, is the key to delivering future proof investments in digital ecosystems.